It’s well known that Ernest Hemingway had outsized appetites: for adventure, food, drink, and women. Yet by his own admission these appetites led to losing the great love of his life: his first wife, Hadley. Regarding Hadley, Hemingway says that she will always be the “true part of any woman I write about”. Hotchner is one of the great chroniclers of Hemingway’s life. 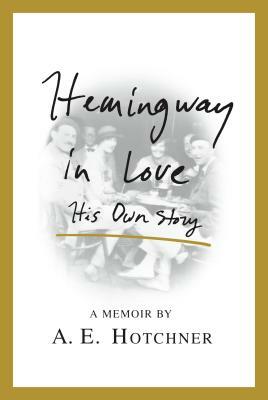 This slim memoir will give Hemingway fans more personal details when, old and unwell, he looks back on his younger self in his early days of success and excess. In June of 1961, A. E. Hotchner visited a close friend in the psychiatric ward of St. Mary's Hospital. It would be the last time they spoke - three weeks later, Ernest Hemingway returned home, where he took his own life. Their final conversation was also the final installment in a saga that Hemingway had unraveled for Hotchner over years of world travel. Ernest always kept a few of his special experiences off the page, storing them as insurance against a dry-up of ideas. But after a near miss with death, he entrusted his most meaningful tale to Hotchner, so that if he never got to write it himself, then at least someone would know. In characteristically pragmatic terms, Hemingway divulged the details of the affair that destroyed his first marriage: the truth of his romantic life in Paris and how he gambled and lost Hadley, the great love he'd spend the rest of his life seeking. But the search was not without its notable moments, and he told of those, too: of impotence cured in a house of God; of back-to-back plane crashes in the African bush, one of which nearly killed him, while he emerged from the other brandishing a bottle of gin and a bunch of bananas; of cocktails and commiseration with F. Scott Fitzgerald and Josephine Baker; of adventure, human error, and life after lost love. This is Hemingway as few have known him - humble, thoughtful, and full of regret. To protect the feelings of Ernest's wife, Mary, who was also a close friend, Hotch kept these conversations to himself for decades. Now he tells the story as Hemingway told it to him. Hemingway in Love puts you in the room with the master and invites you to listen as he relives the drama of those young, definitive years that set the course for the rest of his life and dogged him to the end of his days. A.E. HOTCHNER is an effervescent and charismatic nonagenarian. A life-long writer, he has written eighteen books including his 1966 internationally bestselling biography of his close friend Ernest Hemingway, Papa Hemingway. His memoir, King of the Hill, was adapted into a film in 1993 by Steven Soderbergh. In addition to his successful, decades-long writing career, Hotchner is co-founder, along with Paul Newman, of Newman's Own foods. He lives in Connecticut with his wife and pet parrot, Ernie.